Whenever I welcome educators or visiting groups of students to the C.H. Nash Museum at Chucalissa, I emphasize that other students created almost everything the visitors will see at the Museum that is less than five years old. This includes our introductory video, Drumming Across Cultures musical program, herb garden, and much more. From 2008 through 2011, students completed over 35 projects at our small museum. The students include both graduate and undergraduates participating as interns, graduate assistants, for Masters level practica, and for class-based projects. The projects include exhibit creation and design, program creation, collections projects, event planning, to name a few. The University of Memphis applied academic programs support this work. 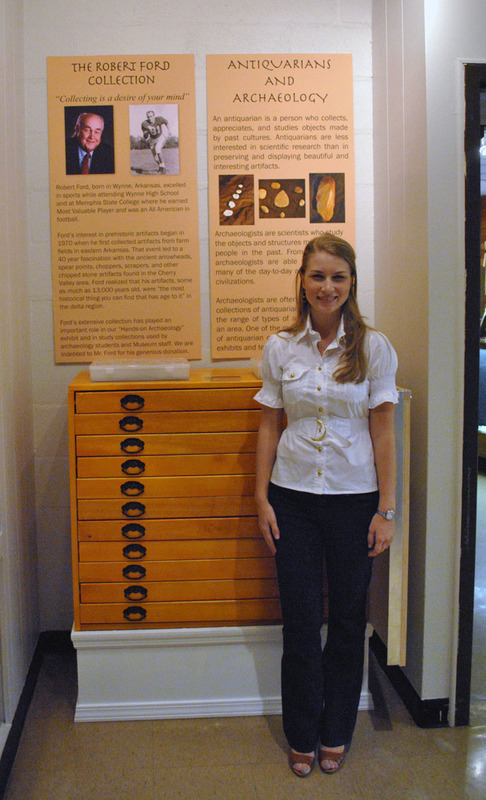 Students in the University of Memphis Museum Studies Graduate Certificate Program also complete many internships and class projects in other area museums. Conceptually, this work allows the student to apply what they learn in the classroom in a real-time situation. For many of the smaller museums and cultural heritage organizations in West Tennessee, these student projects have made a significant impact over the years. This relationship between the student and community also helps each partner to have a reciprocal stake in each other. For the small museum, the University becomes a resource to carry out their community needs. For the student the small community museum takes on a part of their creative experience. The process forms a relationship that can continue beyond the end of the semester. I am engaged in two very exciting community service learning projects at this time. First, we are hosting an AmeriCorps team at the C.H. Nash Museum for one month this spring. This coming Thursday, our museum will partner with the AmeriCorps team in constructing a ghost house to represent a structure that stood in prehistory at the Chucalissa mound complex. The AmeriCorps team has construction experience, at the museum we have ideas, and an anthropologist/architect has drawn up some tentative plans for the structure. Stay tuned for more information on this process. My Applied Archaeology and Museums class this semester is also participating in a community service learning project. The class is working with the Public Education Committee of the Society for American Archaeology (SAA) to upgrade their Archaeology for the Public webpages. The webpages were created a few years ago and are a primary source of public information in North America on all things archaeological. The students are challenged not just to do the technical tasks such as finding broken links, but also to think about the SAA’s mission, what they have learned this semester in class, and apply it to the revision process. How does your institution form reciprocal relationships through community service learning?